Either scheme would have the effect of making the lovely fires more expensive because the cost of the tax or the emission certificates would be added to the price of the goods and services. Naturally, the people would end up paying more, but that was the whole point. All the good things in modern life were destroying the planet so they had to become too expensive to buy and the leaders said that was a sacrifice they were willing to make. The tax idea was popular among people who were genuinely concerned about society and the state of the planet. The ETS concept wasn’t very popular at first except among some way-out entrepreneurs, until a few big businesses unexpectedly supported it, starting with Enron, a famous US natural gas company you might have heard of which has since closed down. In recent years, more and more support has been given to an ETS and “carbon” exchanges have been set up around the world to trade in carbon emission certificates. Most recently, the banks have expressed tremendous interest, which tells us there’s serious money involved and that some kind of trading system is now inevitable. Nobody can stop it. It also tells us that carbon trading is not about the climate. Don’t let anyone tell you that it is. It’s about making money, not altering the weather. Carbon trading is such a complicated aspect of the “global warming” wonderland that it cannot be described in just one article (nor probably even in one book). I want to explore carbon trading over the next few weeks or months. I have no agenda here, no list of topics to cover, just an interest in exposing the ETS scam for what it is — a way to make money for nothing and independent of climate change. If you have a contribution to make to this exposition, please email me at richard (at) wordshine.co.nz. I’d love to see articles with a New Zealand flavour, but your comments and questions are welcome. I guarantee to put the most ardent environmentalist off the idea of using an ETS to “fix” global warming because it’s so risky for our economic and social health (apart from being grossly unfair and based on a non-existent problem). Here’s a good summary of some of the problems with carbon trading from Ross Clark, writing in The Express. Efforts to cut carbon emissions and save the world from environmental cataclysm were scuppered at the Copenhagen summit last week by vested interests who want to carry on polluting – or so Gordon Brown and the climate change lobby would have us believe. But it is a fantasy. There are far bigger vested interests raking in a fortune from the panic over global warming. Governments did not commit themselves to emissions reduction targets last week, but they did agree to work towards the development of a global carbon market. Carbon trading, which involves companies buying and selling permits giving them the right to pollute, might sound innocuous but it is developing into a massive scam which enriches banks and big businesses at our expense. If you are unsure what carbon trading is, this is how it is supposed to work. Company A, a steel manufacturer, designs a new plant which uses less energy than the one it replaces. Company B, which runs an aluminium-smelting factory, wants to expand. In doing so it will have to emit more carbon, so it has to buy permits from company A. In theory the scheme places a cap on carbon emissions – you cannot increase your carbon emissions unless you can find someone who is reducing their emissions and therefore has a permit to sell. In practice carbon-trading has had farcical results. The EU introduced a carbon emissions trading scheme in 2005. 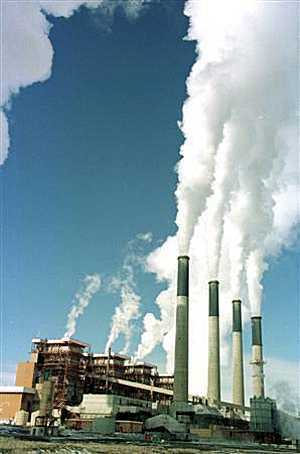 Polluters were handed an allocation of carbon permits based on their historical carbon emissions and then allowed to trade the permits if they wanted to increase or decrease their emissions. The oil companies, given huge amounts of permits, found it easy to trim their emissions a little and so make huge profits. Expanding businesses and public services, on the other hand, were forced to buy more permits. In its first year of operation Shell made a profit from carbon-trading of £49.9 million and BP a profit of £43.1 million. NHS hospitals [financed from taxes], meanwhile, made a loss of £5.8 million. The scheme later failed because the EU issued too many permits and the price of them collapsed. But that has not stopped the EU from instigating phase two of its carbon-trading scheme, part of an international market now worth £75 billion a year. Already it has spelled disaster for 1,700 steelworkers on Teeside. Corus, the company that grew out of British Steel when the industry was privatised in the Eighties, recently announced that it was to mothball its plant at Redcar. It claimed falling global demand for steel, though an alternative explanation is that Corus’s parent company, Indian steel giant Tata, has realised that it can pocket £1.2 billion by selling the carbon permits that allowed it to pump CO2 into the Teeside air. Meanwhile, the company is expanding production in India, where it does not have to buy permits. But guess who else profits? The carbon market is based in the City [of London], where traders will be creaming off a nice fat slice of that £1.2 billion worth of permits. Steelmakers are being thrown to the winds and banks allowed to pocket a fortune — with no reduction whatsoever in global carbon emissions. If you think that the City is full of greedy parasites now, just wait until the carbon market goes global. Then we will have the absurd spectacle of shrinking industries in the West making a profit out of expanding industries in the developing world. Gordon Brown doesn’t even disguise his ambition to make the City the carbon-trading capital of the world — in 2006 he boasted that the City would profit hugely from the fight against climate change. If, that is, US banks don’t grab the business for themselves. One of the reasons why the US is suddenly so interested in climate change is that its banks have been lobbying Barack Obama to introduce an American carbon-trading scheme, which they hope will then evolve into a global market with them in the centre. It isn’t just carbon-traders who are making fortunes. There are also the snake-oil salesmen who run the carbon offset market. Asked why Tony Blair flew to Copenhagen by private jet a spokesman tried to reassure us that he had “offset” his carbon emissions by contributing to a scheme that reduces emissions elsewhere. Carbon offsetting has grown into a multimillion business which preys upon the guilt of airline passengers, buyers of patio heaters and many others. But it is a nonsense. Delegates who jetted to the G8 summit in Gleneagles in 2005, for example, were given certificates to say that their emissions had been offset through a scheme to replace the tin roofs of huts in a South African township. The scheme got bogged down in bureaucracy but even if it hadn’t, it would only have reduced carbon emissions so long as the South Africans carry on living in tin huts for years to come. The climate-change lobby will continue to try to portray all sceptics as stooges for big business. But it isn’t true. Big business jumped on the climate change bandwagon long ago. That is where the real money is now to be made. A recent and very authoritative scientific paper by Dr Wolfgang Knorr of Bristol University, has created a flurry of interest in scientific circles. Knorr found that only 45% of CO2 emissions remain in the atmosphere and that this percentage has remained static for the last 150 years. The remaining 55% is always sequestered in the biosphere (vegetation) and the hydrosphere (the seas). It seems, then, that the volume of CO2 being sequestered by the global biosphere is predetermined by some inscrutable law of nature which science has not yet plumbed. It makes no difference how many trees or shrubs or algae might be growing at any given time. So, how can we say that additional pine trees will increase the percentage of CO2 taken up by the biosphere? There’s no science behind the scheme of carbon credits. Only money. Your comments are very helpful, Barry. I hadn’t made that connection — that it probably doesn’t matter how many extra trees we plant. It is mysterious!